How to wrap gifts with leftovers. Home » Frugal Living » How to wrap gifts with leftovers. I’ve mentioned before that I’m no fan of the greeting card and gift wrapping industries. Not only are their products way over-priced, they’re also less than original in most cases. So, when I stumbled across a site that showed me how to wrap gifts beautifully using bits and pieces around the house, well, I was more than pleased…especially at this time of year. It’s called Wrap Art. I must first say a big thanks to John Boak (a fellow Colorado dweller) for giving me kind permission to reprint images and text from his cool site Wrap Art. I certainly didn’t have the time to photograph my efforts in this arena, and he’s a pro at this kind of thing (as you’ll see from the pictures below). 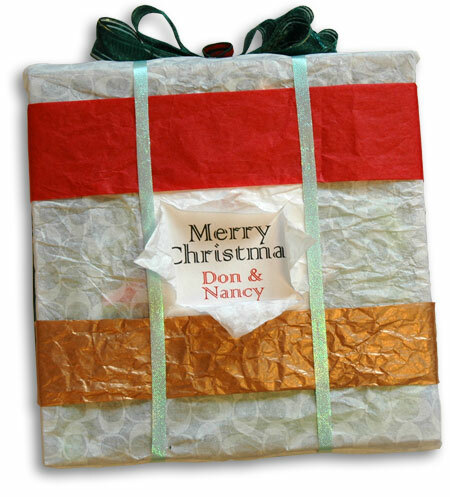 Wrap Art combines two of my favorite pastimes – budget living and creativity. 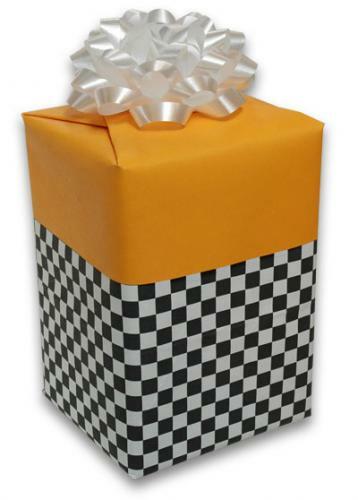 And you’ll be surprised at just what you can use to wrap a gift and how cool it can look. 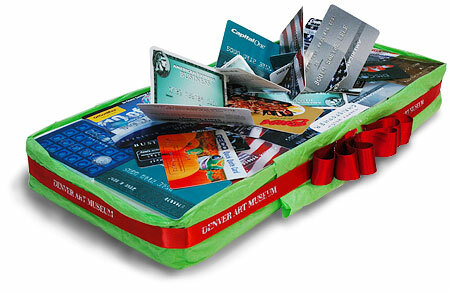 Anything from pieces of old foam rubber to plastic shopping bags and fake credit cards (seriously) can be used. You can also utilize those scraps of wrapping paper you often have left over that are too small for a gift. Combining papers is way cooler, and the results are, well, you’ll see for yourself. Note: Before you dive into just a few of the many projects at Wrap Art (check out all of the galleries, there are a ton of ideas in them) I would also suggest a copy of John’s book for even more ideas or as a great gift. Of course, be sure to memorize a fabulous wrapping method before you wrap it. 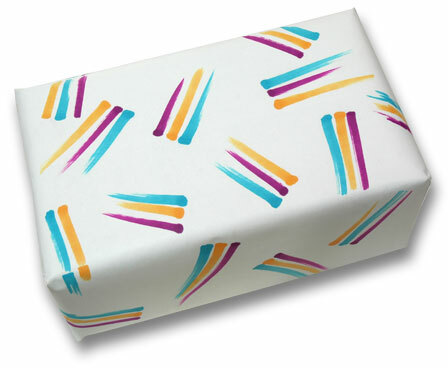 To simply throw some traditional wrapping paper around it would be a travesty. Enjoy. First I wrapped the gift in red tissue. 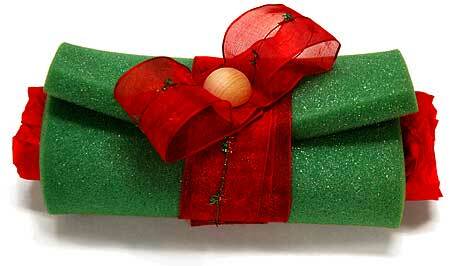 Then I wrapped it in green packing foam, holding it together with red tinsel-trimmed ribbon. I made a quick-glued bow of the same material and finished it was a small wooden hemisphere. The wrap has charm and a sense of humor. This wrap is a creative excursion. I wanted to see what I could do with all those fake cards that come in the mail. They are glued flat at first. Then I cut them and made an angular sculptural "bow" of cards. The outer edge of the gift is a tissue frame, with a red ribbon. The red bow is made by layering ribbon back and forth, adding a spot of glue on each pass. Contrast: commercial trash/gift & ribbon. Red/green. Flat/dimensional. While wrap art can be made with scraps of regular wrapping paper, I also save special papers. The yellow paper is an art paper. The checkered paper was a shopping back. Their contrast is a delight. The white bow brings it all back into the realm of gift wrapping. Contrast: color/black & white. pattern/solid. The bow's shiny complexity/the yellow's flat simplicity. Marker Pattern. A demonstration of a simple way to achieve a cheery look. Easy: limit the number of stroke clusters. Contrast: pattern/solid. Red/green. Angles opposing the rectangle. Straight edges/ wavy edge. Line (cut edges)/ point (white dots). 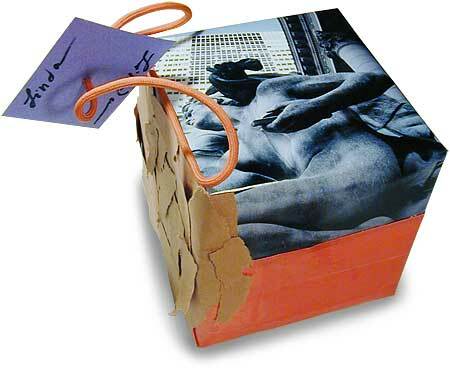 The collage features three papers: a photo of archtectural sculpture from a direct-mail car ad; a red gift bag; and ripped, brown construction paper. The bow is made by capturing a square of blue paper between the ends of an orange shopping bag string. Hot glue attaches the ends of the string to the card and the center of the string to the package. The resulting tag can be placed in a variety of positions. And it works as a handle. Contrast: image/solid. Ripped paper/flat paper. The effect of this wrap was great. The gift box was wrapped first in white. A computer-generated label was placed in the center. I then gave it a tissue wrap. Two bands, red and gold, of tissue "ribbon" were added horizontally. Tissue ribbon is made by folding a wider piece of tissue in thirds, so that the edges are folds, not cuts. Next I added two strips of pale green ribbon. With scissors I made two slices (a "x" shape) in the tissue wrap, revealing the label below. Lastly, I applied a ribbon around the edge of the box, and constructed a "ribbon candy" layered bow with the remaining length of ribbon. Roll it up in tissue. Cut the ends with scissors to create a fringe. Gold frilly ribbon brightens up and complete the wrap. Contrast: light/dark. dull wrinkles/bright gold. All wrapping descriptions reprinted with kind permission of John Boak. Thanks John. Years ago, my inlaws moved on to cloth gift bags that my MIL made herself. They are made of scraps of all kinds of fancy fabrics and are each unique and beautiful. I copied her and made Christmas bags to use for gifting close family members. I bought Christmas fabrics on sale after the holidays (really cheap!) and made bags with ribbons sewn on to tie shut. The first few years was a bit of sewing- and then occasionally still for an odd shape- but now we have just about any shape or size could be accomodated by bags we already have. Santa still wraps for kids at our house- but when the kids are older, its going to be bags all around. and definitely in the spirit of Wrap Art. I think it's that kind of improvisation that John is encouraging, and I applaud it. Nice work! I love these ideas... it is good to know others do it. Sometimes I need to see it to get going and do it myself! I'd love some instructions for how to wrap gifts origami-style without tape or glue. Yes, I can hold packages together with ribbons. But isn't there a way to fold the paper around a gift so that it all tucks together without needing anything else to hold it? My friend gave me a gift for our new baby wrapped in a fleece blanket and pinned with diaper pins. It was very cute, and useful! She told me they also wrap in towels, beach blankets, etc. Very creative! but time consuming during a very busy time of year. I don't understand why everyone thinks gift wrap is such a BIG expense???? I bought a 40 sq. ft. roll of AMERICAN MADE gift wrap at Walmart for 96 CENTS!!! 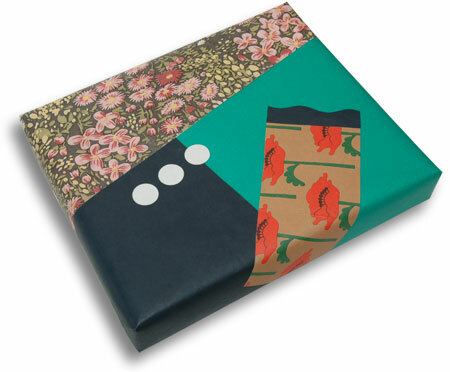 I purchased a shirt gift box covered with various layers of gift wrap with a greeting card front in the center. I am looking for a pattern to do it myself!